Q. Where do I get help to proofread my paper? Where can I send my paper for proofreading? The Center for Academic Success (CAS) is on every campus, and helps students with writing papers and citing references. They will give you feedback on organizing and developing your ideas, and guide you with academic writing, grammar, and MLA and APA formats. They will show you the best ways to revise and proofread, but they do not proofread your work for you. 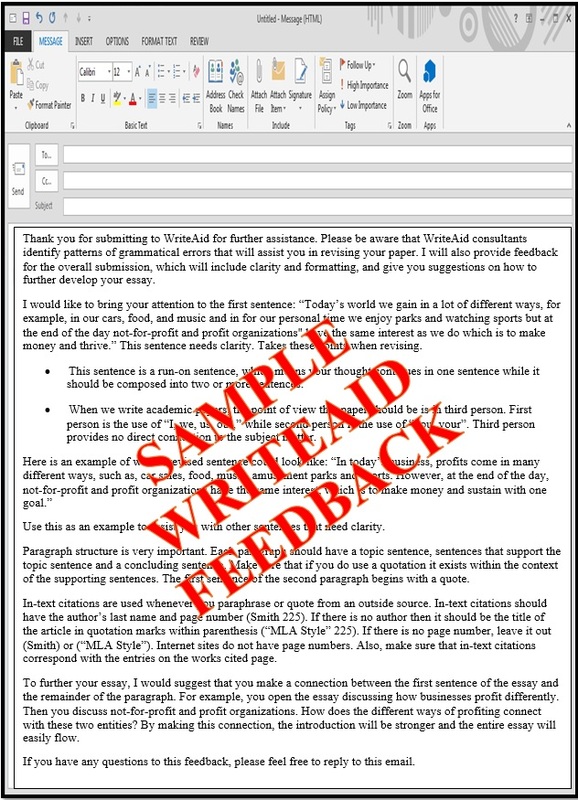 To get this help and learn how to improve your writing, you can set up an appointment in TutorTrac, or go to your closest CAS to see a writing tutor in person; or use CAS Anywhere to video chat online as you review a draft of your writing; or submit your paper to WriteAid to get feedback via email. Or go to the Purdue OWL website (Online Writing Lab [OWL] at Purdue University) for great suggestions on how to proofread your own writing. 2. Click the link labeled “For email assistance with your writing, submit your paper to WriteAid”. 3. Use your Canvas username & password to log in and complete submission form. Include as much information as possible. Papers of 1- 6 pages will be returned in 48 business hours; papers of 7+ pages will be returned in 72 business hours.